French Press is one special type of device in which coffee is prepared. Therefore, the coffee made in a French Press is called French Press Coffee. But what is the significance of this machine? Find out the answer below. Talking about the working of this French Press, here the coffee grinds are pressed to the bottom of the vessel to get the best of the extracts. After the brewing process completes, the coffee grounds are pressed into the base of the pot. The main purpose of this unit is to collect the pure flavor of the coffee, with this pressing. Coming to the preparation part, using a French Press is easy. First, you have to add c﻿oarse coffee grounds. Then into the vessel, add boiling water. Here depending on your brewing preference add the water, and coffee grounds. After about 4 minutes of the processing, you can press the coffee grounds and then get that concentrated coffee flavor. And keep the coffee brewing, depending on your choice of brewing strength. Some prefer mild, some prefer medium brew, and there are others who need strong brew! One important point to note during the making of the French Press Coffee is that- coffee grinding level. It is recommended to use coarsely ground coffee beans. The main issue related to the muddy ﻿coffee grounds is eliminated with the use of the coarse coffee grounds. The major benefit of getting ﻿a﻿﻿﻿ French Press is that you could enjoy your favorite coffee within less time. This system is less time-consuming when it comes to the preparation end (It comes the second, first is the Drip Coffee mechanism). 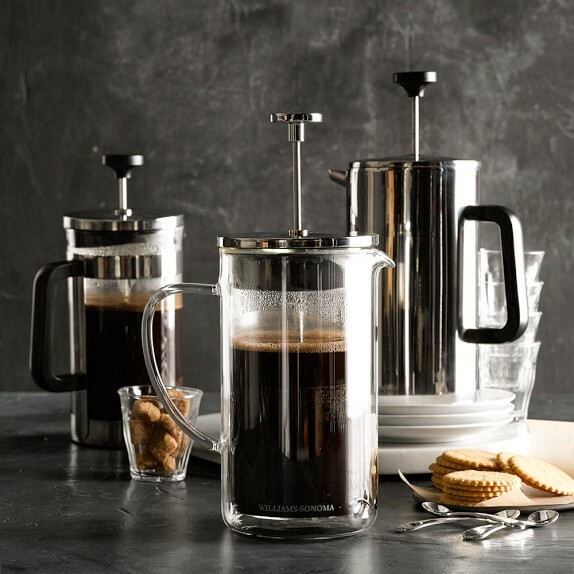 Now that you know all about the French Press Coffee Machines, it's time to choose one! While checking the drawbacks, we came across where people found the taste of the coffee to be bitter. And, it is a bit oily as well, since the coffee ground are pressed for a long time. Still, it is worth trying!